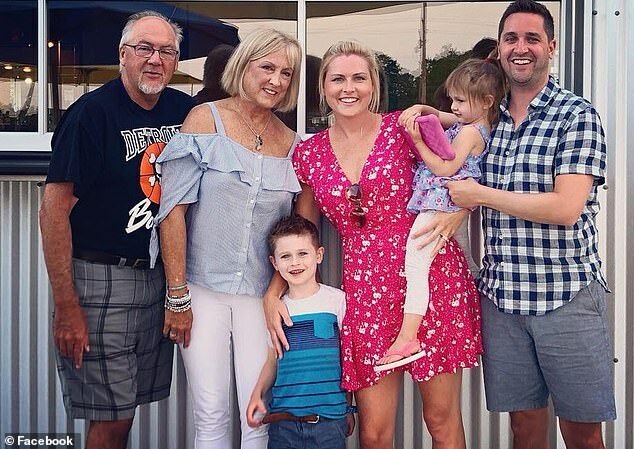 A well-known TV Michigan meteorologist and mother-of-two has taken her own life a month after telling fans she was struggling to recover from laser eye surgery that she got so she could finally stop wearing her contact lenses. In a statement issued on its website and read aloud by her colleagues on Thursday morning, Fox 2 said: 'Last night we were informed of the heartbreaking news that our friend and colleague, meteorologist Jessica Starr took her life. 'All of us here at FOX 2 are in deep shock and cannot believe that such a wonderful, bright and intelligent individual will no longer be with us. Over the last month, Starr said she had been facing 'challenging times' since undergoing Lasik SMILE eye surgery. It involves the surgeon using a femtosecond laser to create a small piece of tissue within the cornea then, using the same laser, they make an arc-shaped incision on the cornea's surface to extract the tissue through and discard it. It changes the shape of the cornea and corrects nearsightedness. Ordinarily, patients' incision heals within a few days, without stitches, and their vision is quickly improved. It is unclear where Starr underwent her procedure in Detroit. In a video uploaded to her Facebook page on November 13, the day she went back to work, she was downcast as she asked viewers for their prayers and well wishes. 'I am struggling a little bit so I need all the prayers and well wishes. This is a hard go. 'If you have any tips I'd appreciate it, I'm trying to stay strong and get through this recovery. 'Thanks again for all the wishes, I'm excited to be back I just want to get my vision back so I can keep you guys smiling,' she said. The following day, she posted that she had not yet been ready to go back to work. Yesterday was a struggle for me. I really wanted to come back but I need more time to recover. 'Please keep me in your thoughts during this challenging time. Will keep you updated,' she said. It was her final post. Before working for Fox 2, she worked for Fox 45, WKAG 3 and WLNS. Hers is the second laser-eye-related surgery in a month. Of some 600,000 Americans that get laser eye surgery, or LASIK, only about one percent experience complications. But for those who do, the effects can be devastating. In 2017, the US Food and Drug Administration conducted a clinical trial to assess patient-satisfaction after LASIK. They also found that patients were about half as likely to tell their doctors about developing complications after surgery as they were to admit to these issues in an online survey. The American Refractive Surgery Council claims that LASIK has never been the 'primary cause' of someone's post-operative blindness. Back in 2008, the FDA held a hearing and heard testimony from patients who had suffered from blurred vision or burning eyes for years ever since surgery. Families claimed their loved ones had lost their jobs and even been driven to suicide by the complications they developed after LASIK. LASIK also requires the surgeon to cut a 'flap' in the front of the cornea and fold it back, which raises the risks of infection and, if the flap is not properly replaced, this can cause blurred or double-vision. The newer SMILE (small incision lenticule extraction) procedure is supposed to minimize those risks because it requires a much smaller incision in the cornea. Approved by the FDA in 2016, SMILE so far seems to carry lower risk of dry eyes after surgery. Patients must be 22 years old, and the procedure is only intended to correct nearsightedness and astigmatism. If there are complications during a SMILE procedure, surgeons may have to switch to the more invasive technique, or do another operation. Recovery from SMILE is supposed to be shorter, lasting a few days as opposed to a month. Nearly all patients recorded in FDA data have shown improvements from SMILE, but 10 percent said they had moderate or severe glare and six percent saw halos, though these mostly subsided after a year. However, about 2.5 percent of patients experienced minor deterioration of these corrections after a year. In November, Canadian Paul Fitzpatrick, 56, took his own life after blaming the procedure for giving him 20 years of intolerable pain in his eyes. It is unclear if Starr was taking any type of medication to recover from the procedure. Paul Fitzpatrick, 56, underwent a laser PRK procedure in 1996 that involved removing the thin, top layer of the eye and reshaping corneal tissue to sharpen vision - a predecessor of the popular Lasik eye surgery. Since then, the father-of-two suffered headaches and described feeling needles in his eyes as well as an unbearable dry and burning sensation. He left a suicide note when he took his life in October, which described the pain he felt that pushed him to death. 'Since 1996 Pain, pain and more pain, please forgive me for not being strong enough to cope. If you or anyone you know is struggling and needs confidential help, contact the National Suicide Prevention Lifeline on 1-800-273-8255 or visit their website here.